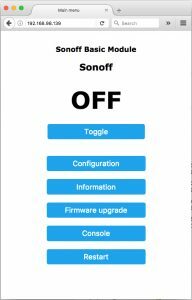 This week I received a new device… Sonoff S20 Smart Switch. First of all I disassemble the switch finding the connector on the board, and they were here indeed. Some minutes after, the S20 board had a four pin connector soldered! An absolutely perfect and complete development that can do a lot of actions in our Sonoff switches by means of different short presses of the button! Really amazing! There’s no time to loose… come on! Download and unzip the NeoPixelBus library into directory portable\sketchbook\libraries and rename to NeoPixelBus. In only 5 minutes my S20 device was hacked, modified and assemble… time to test it! It entered in “config mode”, and after search the IP Address that my router assigned to this device, I putted it on my Firefox and I freaked out! You can modify ALL the configuration, connect to an OpenHAB, configure MQTT protocol, and many more options! Definitively this Sonoff-Tasmota firmware was a great discovery!